Diane Moser begins her memorial composition to the victims of 9/11 with an upbeat Big Band horn motif which seems surprising, even astonishing, until you realize the piece mimes the whole day, beginning with the pristine sky, sun blazing, everyone one his or her way to work, the streets packed with rushing cars and cabs, everyone brash, breezy and optimistic. Almost at once the sombre, premonitory bass counters, and for a few bars the horns and the bass alternate tentatively. Diane is a brand new colleague of mine at Vermont College of Fine Arts, a colleague since she joined the faculty of the equally brand new MFA in Music Composition Program. She’s a composer, jazz pianist, and mourner. These are all songs of mourning, as it were — for 9/11, for mother and father, for gifted friend. In every piece there is a darkness (from the bass, from the left hand) that battles against the liveliness of the music itself. Diane’s an amazing composer, with a special sense of the recuperative and redemptive effects of music and the capacity of jazz to embody the complex light and dark of life. The thrumming, gloomy bass reminds us of death; but the music dances with energy, rushes toward the light. It’s a huge pleasure to introduce her here on this memory-filled day. In the photo above, taken my Dennis Connors, Diane appears with bassist Mark Dresser. The artist photo below was taken by Chris Drukker. I composed this piece to help the healing process from the attacks of Sept 11th, 2001. All of us went through so much on that day and the weeks that followed, and I felt as a composer that I needed to express my feelings and to help others as well. One of the recurring themes in NYC in the aftermath was the sight of people who were putting up posters, trying to locate their loved ones, and that’s what got me started on this composition. The music begins with a motif that expresses exactly the kind of morning we had, sparkly, bright blue, barely a cloud in the sky. The bass solo is a foreshadow of what was coming. As the bass solo continues, the brass introduction goes from the bright sparkly motif, to wide open, dark harmonies, slowly descending, which represents the towers coming down. I chose a slower tempo for this, because in that moment, as we watched from our TV sets and from the streets of Montclair, NJ, where I live, everything seemed to go fast and in slow motion at the same time. The next section is a motif built on the spoken phrase “Where are you?” This is what I imagined was being said by people who were looking for their loved ones who had vanished that day. The third section is my vision of the souls of the people who perished that day and their Journey Home. “The Journey Home” composed in memoriam for the victims of the attacks on Sept 11th, 2001. Live recording of Diane Moser’s Composers Big Band May 2008, Trumpets Jazz Club, Montclair, NJ. Composed by Diane Moser October 2001, premiered Nov 2001 at Tierney’s Tavern, Montclair, NJ. Soloists: bassist Andy Eulau, alto saxophonist Tom Colao, trombonist Ben Williams. http://www.myspace.com/dianemoserscomposersbigband. This is a composition I wrote a few days after my mother died unexpectedly. I was supposed to speak at her service, but I decided playing the piano was a better way to express myself. I started with arranging some of her favorite songs, none of which I really inspired me. The next day I decided to experiment with her name as a musical cryptogram, assigning notes to her name. After working with the notes, I found harmonies and created open spaces for free improvisation based on the themes. I have arranged this piece (and performed it) for everything from solo piano to big band. “For My Mother” composed by Diane Moser 1998. Tthis recording from the newly released cd “Duetto” with bassist Mark Dresser, CIMP Records release date July 3, 2012. http://www.cimprecords.com/albums/?album=786497576920. Also available on itunes http://itunes.apple.com/us/album/duetto/id515078907. Review by Robert Bush for the San Diego Reader http://itunes.apple.com/us/album/duetto/id515078907. This composition is a tribute to the late, great jazz pianist Mal Waldron. I composed it a few days after he died, and after listening to a memorial broadcast of his music from station WKCR, Columbia University, NYC, and walking in the freshly fallen eight inches of snow we got that day. The melody just came to me after that walk through the snow, but I also added the chimes from a local church that I heard as I rounded the corner going home. I only had one melody, but I divided it into two fragments and juxtaposed them,and then reversed the juxtaposition. The chimes come in after each juxtaposition. The groove that I set up in my left hand is totally in tribute to Mal, who as Elzy Kolb writes in the liner notes of WDMO about Mal: “left-hand-that-rules-the-world-approach.” After that groove, the trio is free to follow where ever the spirit takes us, and then we come back in the way we started. 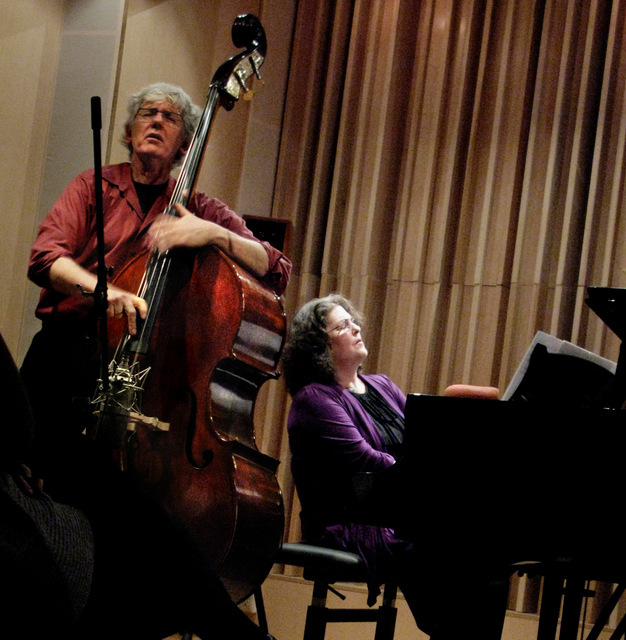 Diane Moser has been a featured performer and composer throughout the US with jazz ensembles, big bands, orchestras, chamber music, dance and theater companies since 1975. Since 1996 she has been the music director/contributing composer/pianist for her 17 piece Diane Moser’s Composers Big Band, dedicated to developing and presenting new music for big band. Her other groups include the Diane Moser Quintet, and the Diane Moser Trio. She is a fellow of the MacDowell Colony, the Virginia Center for the Arts and in 2011 was named the Mid-Atlantic Arts Creative Fellow at the Millay Arts Colony. She has received composition awards from Chamber Music America, Meet The Composer, the American Music Center, the Mary Flagler Carey Charitable Trust and the Alice M. Ditson Fund of Columbia University. Recently she composed and recorded the music for the award winning documentary “Breaking Boundaries: The Art of Alex Masket.” She has been a featured pianist and composer with Mark Dresser, Marty Ehrlich, Gerry Hemingway, Howard Johnson, Oliver Lake, Tina Marsh, Charles McPherson, Lisa Sokolov, Yale Strom, poet Bill Zavatsky, the Drifters and many others. Since 2006 she has been a member of the core faculty for The New School for Jazz and Contemporary Music (NY, NY) where she teaches composition, improvisation and history courses. 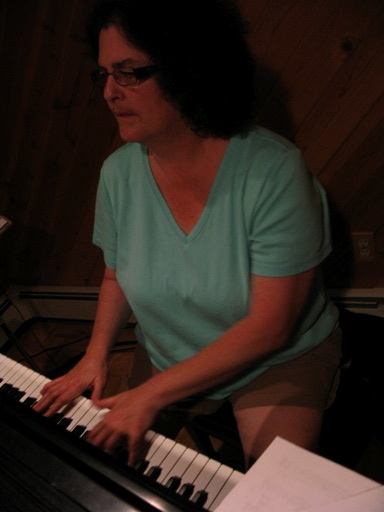 She is also a member of the core faculty at the Vermont College of Fine Arts MFA in Music Composition Program. Diane’s music runs the gamut of straight ahead to experimental, using free and structured improvisation, graphic scores and the environment as source material. Her current projects include a suite based on birdcalls, culled from a MacDowell Colony residency where she improvised and recorded with birds over a period of 5 weeks, and a large work for her big band based on the concept of the Music of the Spheres, specifically the theories of Pythagoras, Johannes Kepler, NASA’s Voyager 1 & 2, and the writings of Hazrat Inayat Khan. Oh wow. This made my morning. All these pieces are lovely and deeply compelling. I found “For my father” particularly moving—ethereal and complex. Thanks so much for putting these up! It’s my privilege to know Diane and to have caught her many times with her big band, and once at the Kitchen with her friend, the great Mark Dresser.